There can be no doubt about the beauty and sophisticated sound of this antique Neuner & Hornsteiner Mittenwald violin which was handcrafted around 1900. 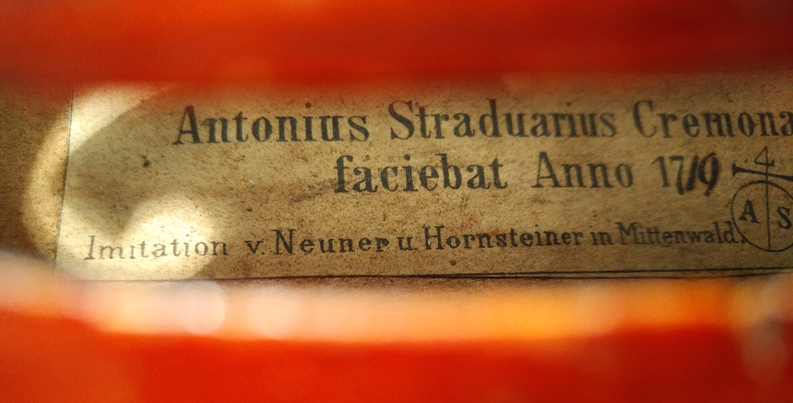 The inside label indicates that it was made on a Stradivarius model by the Neuner & Hornsteiner firm that refers back to the Neuner dynasty of violin makers, one of the oldest and most respected families in Mittenwald. This violin is a typical “Mittenwalder,” made of good quality sound woods from the region: moderately grained spruce was used for the top, and the two-piece back is made of flamed sycamore maple. Clear traces of use, some of which have been touched up can be seen along the red-brown varnish of the instrument, indicating that previous owners clearly enjoyed playing it. We are offering it in undamaged condition, ready to play; our luthier worked it over, ready to unfold its beautiful sound.